I read this article and found it very interesting, thought it might be something for you. The article is called Ooho water-on-the go, Eat the Bottle after Drinking your Waterand is located athttp://innov8tiv.com/ooho-water-on-the-go-eat-the-bottle-after-drinking-your-waterooho-can-now-eat-bottle-drinking-water/. These days tap water just doesn’t cut it for a lot of people. Sometimes it is out of legitimate causes of concern about the suitability of the water source or supply system. So people have resorted to drinking bottled water. The only problem is, the aftermath is a lot of plastic bottles being thrown away. Here is where Ooho comes to the rescue. You see waste plastic bottles have become a menace, especially in countries with no to little recycling system in place. Even in countries with advanced recycling system, the carbon footprint of recycling plastic bottles is too high; and we all know the devastating effect that has on global warming and climate change. Well a London-based seaweed-tech company, Skipping Rocks Lab, has come up with an innovative solution around the plastic bottle wastes. 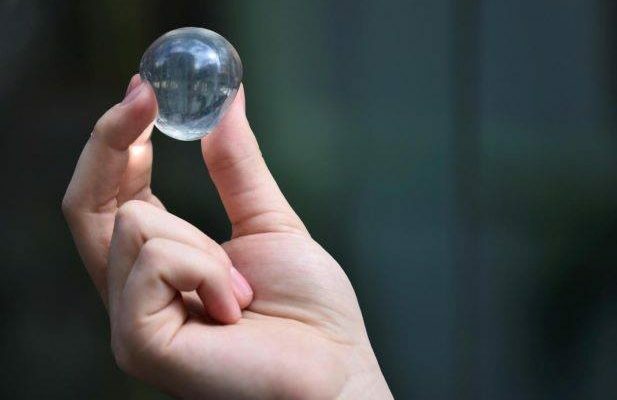 They have come up with Ooho, an edible water bottle. That’s right, a bottle you can eat after you’re done drinking your water. Then again, you could just drink/eat the whole damn thing. Well Skipping Rocks Labs, have come up with a way to turn edible algae into containers (bottles). The algae can encapsulate any beverage; be it drinking water, soft drinks, spirits, and even cosmetics. The goal of their invention was to eliminate the use of plastic bottles and cups, which later turn into waste garbage, with a high carbon footprint when (if) recycled. The algae are made into a container that is both edible and biodegradable. Our packaging is cheaper than plastic and can encapsulate any beverage including water, soft drinks, spirits, and even cosmetics. Our first product, Ooho, will revolutionize the water-on-the-go market… our proprietary material is actually cheaper than plastic.